A Men’s Shed will be opening in Stirling in January 2018. 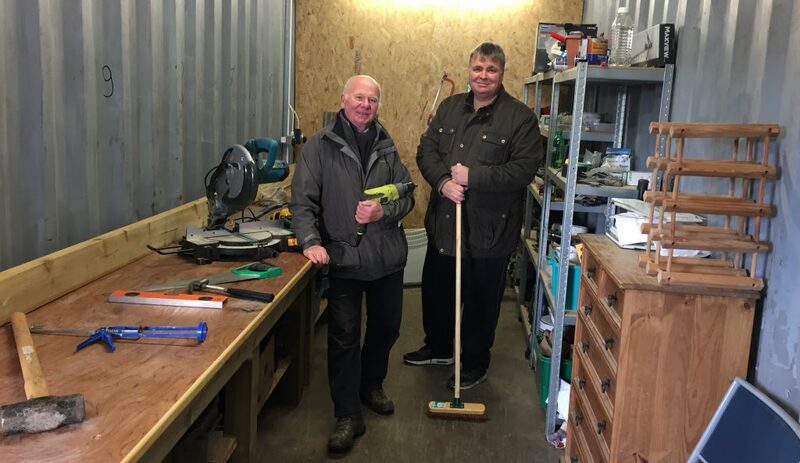 Braehead Community Garden has joined the Men’s Shed movement and converted a shipping container into a workshop. A public meeting is being held on Wednesday 17 January for any interested local “shedders”. Volunteers are in the process of kitting it out with all sort of tools for making and mending all sorts of things. Braehead & Broomridge Community Development Trust has secured funding to open a “Men’s Shed” at Braehead Community Garden in 2018. Volunteers at Braehead Community Garden have already converted one of the garden’s large shipping containers into a workshop and secured funding to purchase tools, thanks to a grant from Foundation Scotland and Stirling Council’s Community Pride Fund. Organisers are holding a meeting for interested “Shedders” later this month, with the Shed opening in February. Initially there will be a weekly two-hour drop-in workshop, but once shedders know what they’re doing, they’ll be able to access the workshop whenever they wish. Membership of the Shed will be just £12 per year. Shedders can work on their own projects or get involved with community projects, helping maintain green spaces or building things for schools, libraries or individuals in need. Activities in Sheds vary greatly depending on what activities shedders wish to pursue, but could include woodworking, metalworking, repairing and restoring, electronics or model building. Sheds attract people of all age and skill levels. While the focus will initially be on starting a Men’s Shed, organisers hope that if there is a demand, that a “Woman’s Shed” and a “Mixed Shed” will follow shortly. Shedders will automatically become members of Braehead Community Garden, allowing them to take part in the many social and community events held throughout the year. Shedders do not have to live in Braehead to join. Potential Shedders are invited to find out more at a public meeting, held in Braehead Community Garden’s clubhouse, on Wednesday 17th January at 7.30pm. There will also be a drop-in event at the garden workshop on Tuesday 23rd January from 10am-noon. For more information on the Men’s Shed movement, log onto the UK Association’s website or the Scottish Association’s website.